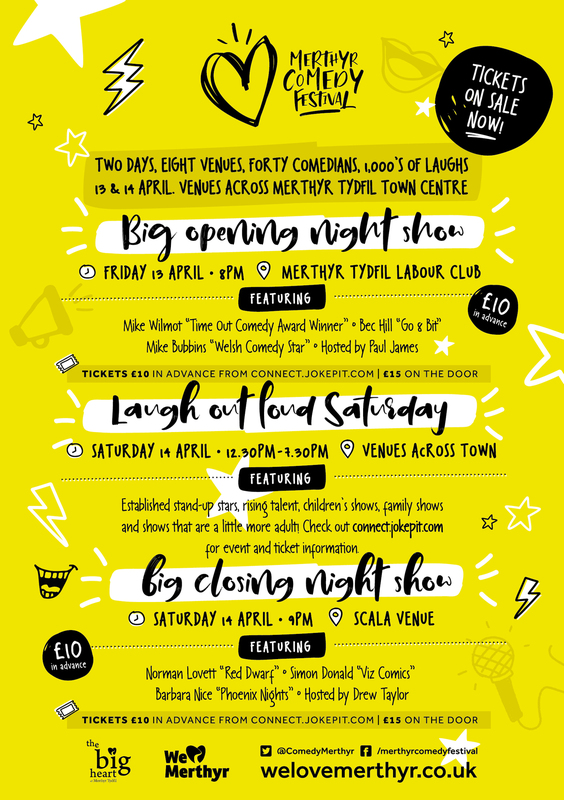 Top comedy-circuit stars and rising talent from across the UK will be coming to Merthyr Tydfil for the town’s very first Merthyr Comedy Festival this April. Taking place on Friday 13 and Saturday 14 April, over 40 comedians will be taking part across 2 days and 7 venues, with audiences guaranteed a laugh around every corner. For the full festival programme, click here Merthyr Comedy Festival Brochure. Organised by The Big Heart of Merthyr Tydfil Business Improvement District (BID), shows take place in Merthyr Tydfil Labour Club, The New Crown Inn, Woodfired, The Brunswick, Redhouse and Canolfan Soar. More updates are available on the Merthyr Comedy Festival and We Love Merthyr Facebook pages.